‘Vollkorn’ is German for ‘whole grain’. This bread is not a whole grain bread. It’s an approximation of such that’s lighter and not quite as dense as a full whole grain loaf. It’s not really ‘vollkorn’, but it’s very good indeed. Germany would not be happy, but might eventually get over it. All that said, this loaf comes from the same stable as all those dense, heavy Northern European ryes and whole wheat loaves, thick and substantial loaves baked long and slow to a dark crust. 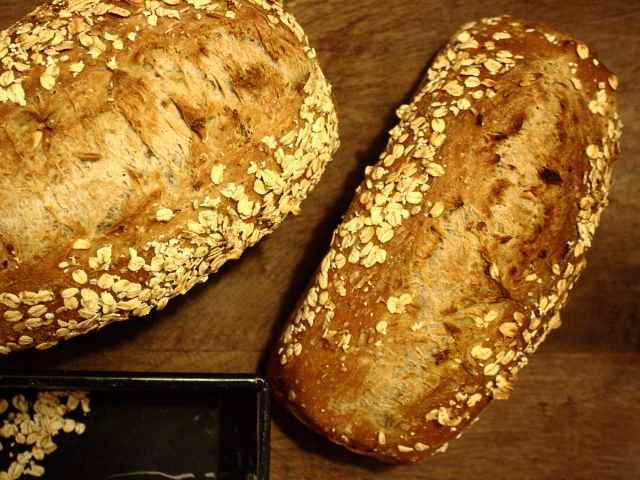 This vollkorn substitutes the rye for white bread flour, and packs in a bewildering variety of seeds and grains that bring body and a certain heartiness. This backbone of seeds and grains is the main point of the loaf – start with a large bowl and add 25g of wheat grains, 25g of rye grains, 25g of whole barley grains, 20g of chia grains, 20g of jumbo rolled oats, 50g of sunflower seeds, 20g of linseeds, 15g of coarse polenta, and 15g of sesame seeds, along with 150ml of hot water. It’s very likely that you won’t be able to get hold of the entire list of grains and seeds (what are chia grains, anyway? ), so chop and change as necessary. Upping the weight of oats is a good, cheap counterbalance that won’t upset the balance of the loaf too much. Let the grains soak overnight, then drain off any water that might not have been completely soaked into them. The bread itself is fairly straightforward – mix together 400g of strong white bread flour, 8g of salt, 10g of honey, 5g of dried instant yeast, 5 g of cocoa powder, 10ml of olive oil, and all the soaked grains. Mix in 300ml of water and bring everything together into a rough dough. The dough will be very wet – add a little more flour to make it manageable, but resist overdoing it … you want a moist, almost sticky dough. Kneading in a stand mixer with a dough hook is a good idea for this sort of wetter-than-normal dough. Knead for at least ten minutes, until the dough is smooth and elastic, then allow to rise for an hour in a covered bowl. Knock the dough back, and leave it to rise again for another half or three-quarters of an hour. Shape the dough into a round and leave it gently covered in clingfilm on a floured work surface for fifteen minutes. This is the ‘bench rest’. I never used to bother with this sort of short rest mid-process, but it really does add a lot to the finished loaf, making the dough easier to manage in the final stages, and letting the flavour develop just that little bit more. When the bench rest is over, brush the loaf all over with a little water, and roll it in a handful of rolled oats spread over a plate, so that the oats stick to the dough. Transfer the dough to an oiled bread tin, cover, and leave to rise for up to an hour. This last proving makes or breaks the loaf – don’t let it go too far. It’s impossible to say what ‘right’ is … but generally, in a normally heated kitchen, it should be about ready at some point after the forty-five minute mark. ‘Knowing’ when a dough is properly proved is a dark art – just make lots of bread, and eventually, you’ll ‘know’. Slash the top of the loaf with a long stroke from a serrated knife, right down the centre, so that the loaf opens up like a flower in the heat of the oven. Preheat the oven to 240c, and slide the loaf tin in, along with a good blast of water from a spray bottle. Steam is good for the crust. Bake at 240c for twenty minutes, then reduce the heat to 200c and carry on baking for another thirty minutes. The bread is done when it sounds hollow when tapped underneath, the usual routine. Turn the loaf out onto a wire rack and leave to cool completely. This recipe is from Dean Brettschneider’s excellent book, Bread, which has quickly become a central part of my bread making routine. Buy it.